At the risk of creating a real conflict, I will venture to say something controversial. I prefer Yoknapatawpha County to either Narnia or Middle Earth. Now, if your anger has subsided and your blood pressure is back down, I will continue. I think that both Lewis and Tolkien were brilliant in their conceptions of their imaginary worlds and in their craft at peopling and plotting the stories within those realms. I want all my children and students to read, enjoy, study, and hopefully even emulate those two blessings of God, Lewis and Tolkien, from the British Isles. Their works will stand. They have recaptured the heroic tradition. They have proven that Christians can write literature, as if that point wasn’t settled long ago. Still, when it comes to that aspect of literary pursuit technically termed “druthers,” I had druther read the more realistic, usually American, most often situated in the rural south kind of writing. I can breathe the Kentucky air of Jesse Stuart and can feel at home in Port William with that other Kentuckian Wendell Berry. Caroline Gordon wrote some of the best novels, in my opinion, in the twentieth century. In particular, I am thinking of None Shall Look Back and Green Centuries. Flannery O’Connor’s short life left us with the best short stories of the century and two challenging novels and a series of essays that are foundational to understanding literature and the South. Harper Lee’s one contribution, To Kill A Mockingbird, is achingly powerful. Robert Penn Warren’s All the King’s Men is ignored only at someone’s literary and political peril. And space does not permit me to venture into Warren’s fellow Agrarian, Fugitive Poet, New Critic friends and colleagues. Then there is William Faulkner. If he had done nothing else, he would be great for all the literary critics that he has given jobs and missions to. But he created a vast world of literature within the small world of Yoknapatawpha County. It was there, with that amazing assortment of McCaslin’s, Sartoris’s, Compson’s, and Snopeses that I began many years ago to fathom the blessings of the South, so often hidden by humidity, defeat, provincialism, poverty, and violence. All of this brings me around to Bret Lott. I don’t think Bret Lott identifies himself as a Southern author. His own roots and background link him to the South both in the past (his grandparents were from Mississippi) and in the present (he lives in South Carolina), and he has often staged his stories in the South. But he, like many Americans, has moved from place to place. Consider, the man has lived in both California and Massachusetts. That ain’t the South. Nor has Bret Lott created a town, a county, a succession of families, bloodlines, histories, and most important of all, grandfathers haunting and blessing their progeny. Bret Lott or Ben House? Bret Lott slipped into my reading life just a few years back. I regret that we became acquainted so late. He and I are about the same age. Nick, my son, tells me that we look alike, except that Lott is much bigger. I’ll say. He has written some 14 or so novels, quite a few short stories, an autobiography, and now at least two fine books on the writer’s experience. To my near total surprise when I began reading Lott, I discovered that he is a Christian. Two things should be noted. He is not a Christian writer of the sort who whips out stories of Amish looking folks falling in love while sitting in a carriage on the way to a little white rural church. Nor is the writer who we discover is on the church rolls somewhere and who shows up with some regularity to worship service, nods in agreement to the sermon, keeps a Bible on his writing desk, and yet pursues stories evidencing little or nothing of the faith. The slow painful road to redemption: Ancient Highway. My first Bret Lott read was Ancient Highway. A fourth of the way through the story, I thought it was okay. Halfway, I thought is was fairly good. About three-fourths of the way, I was stunned. I was convinced then (about 3 years ago) that the book was outstanding in the way the story unfolded. And, even though the message was overtly Christian with a “come to Jesus” experience at the end, it was redemptive with strong Christian undertones and some overt Christian details. 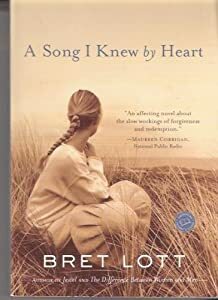 My next Lott book was A Song I Knew By Heart, which is a retelling of the Book of Ruth set in modern times (and largely in the South). This caused a Bret Lott reading frenzy. I found myself picking up used Lott books off of Internet sources and learning bits and pieces about the writer himself. This leads to his latest book and one just before it. 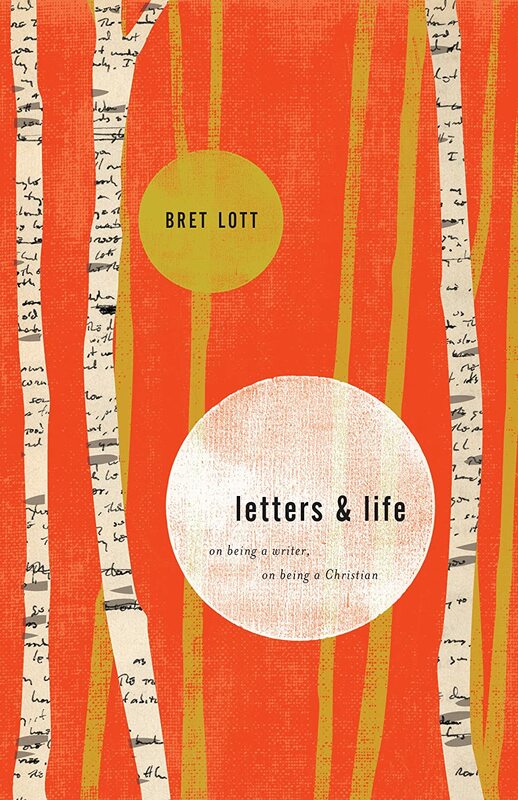 Crossway Books recently published Letters and Life: On Being a Writer, On Being a Christian. The title alone would have hooked me even if I had not already been predisposed toward the author. Any questions about Lott’s faith are answered in the opening essay, where he writes, “My name is Bret Lott, and I believe in God the Father Almighty, Maker of heaven and earth….” He then continues with quoting the rest of the Apostle’s Creed. Lott is a Christ-centered, Bible-believing, born-again, follower of the Lamb. He affirms the supernatural, the Christian experience, and stands up for the faith. Along with that, he teaches writing in a secular university and writes for an audience that is probably not dominated by evangelicals. He is, therefore, addressing those questions many of us face regarding how we are to reach beyond the Christian ghetto and connect with the public square. Lott notes and quotes from some key sources for Christian artists. I am referring here to Flannery O’Connor’s Mystery and Manners, Francis Schaeffer’s Art and the Bible, and the works of G. K. Chesterton. That sample, and there is much more to the whole paragraph, is astounding in its implications. As the old saying goes, the Devil has no songs, and he has no art, poetry, plays, statues, novels, or even limericks. His one work of art, his one creative fiction, didn’t comport with reality and it blame near ruined art, along with every thing else in the universe. Then there is the cross of Christ as the “pure and perfect and whole art.” The cross artistically reunited creature with Creator and recommissioned the creature to a proper artistic calling. Here is the Van Tilian antithesis, the Kuyperian call to impact the world of art, the Rookmaaker lead-in to explicating the Gospel in art, and Dostoevsky struggle for the heart of man. The second half of Letters and Life is a lengthy essay about a time in Lott’s life. It is centered around the death of his father, but through a series of flashbacks and asides, he weaves in many of the events and developments in his life. In this essay, we see the writer at work. We see that the creator of fiction lives in a world of upheavals, joys, sadness, and a world connected to family. I will only mention Lott’s other book on writing. It is titled Before We Get Started: A Practical Memoir of the Writer’s Life. I read this book sometime last year and loved it. I look forward to reading both these works on writing a second time and finding copies of the remaining Lott books I have yet to read. Most people who know me know that I like to live life on the edge. I enjoy standing on the brink of danger. For that reason, I plunged right into the middle of a discussion on books with other pastors, elders, and deacons at a recent meeting of the Wycliffe Presbytery at Grace Covenant Presbyterian Church in Nacogdoches, Texas. This room was not a safe place for a book reader, buyer, addict. Several of the men in the room had written or contributed to books that I have read. All of the men were given to reading, sharing book titles, and debating the worth of different authors and ideas. Add to that, there was enough theological prowess in the room to staff Stonewall Jackson’s circle of commanding officers. Not only was Calvinistic theology the very air we were breathing, but those there were committed to a Kuyperian view of the world. (Meaning, there is not a square inch of the universe where Jesus does not say, “Mine.”). Lest it sound like all brains and no heart, these men are also devoted to the care of souls and are committed to the unfolding of Scripture with applications to their people and our times. I furiously made notes and jotted down titles and fretted over what these book suggestions would do to my budget. Then, I decided that if we cancelled our payment to the electric company, I could buy more books. Total Church and Everyday Church by Tim Chester and Steve Timmis. In Living Prayer by Robert Benson. John said that this book emphasizes the need for prayers at different times throughout the day and exhorts us to have ongoing, patterns of prayer. A Religion in Shoes, or Brother Bryan of Birminham by Hunter B. Blakely. This book is about a legendary Christian in Birmingham, Alabama who ministered to all kinds of people in all places, especially on the streets. BH’s comments: I really need and want the Chester and Timmis books on church life. I have enjoyed reading more on the inner workings of church over the past 2 years, but still need more books and more content to sink in. The book on Brother Bryan of Birmingham is a must have. It is available through http://www.solid-ground-books.com/detail_1706.asp. When Helping Hurts: How to Alleviate Poverty Without Hurting the Poor…and Yourself by Steve Corbett and Brian Fickett. BH’s Comments: Both of these books are much needed warnings to Christians that we not fork over money and gifts in ways that hinder those who are receiving the benefits. It is not a pleasant truth, but much of what we have done to help the poor has only prolonged their conditions. I was reminded of times where I have witnessed the church helping someone where the help did not truly help anyone. The Rage Against God by Peter Hitchens. This book addresses the cultural decline and problems engulfing our society. The Pastor by Eugene Peterson. Emphasizes, among other things, the Christian use of the imagination. BH’s comments: “Amen” to everything that Eugene Peterson has written. I loved The Pastor. That said, the reader has to watch for certain ideas and usages that Peterson has that are not sound. Concerning the Hitchens’ book, it is painful to read these accounts of our cultural problems, but serious Christians really have no choice. I See Satan Fall Like Lightning by Rene Girard. Prayers for My Village by Michael Bouttier. A devotional book written in poetic form. A strong call for a life of devotion, prayer, and concern for those around us. BH’s Comments: I was not familiar with either author or book. I am especially interested in the book Prayers for My Village. Since preaching on the Lord’s Prayer, I have an increasing interest in books on prayer and an increasing awareness of my own prayer needs. BH’s Comments: I read and really liked Keller’s book on marriage. His wife also contributed to the book. We need to be reading books on marriage and implementing the ideas on a continual basis. The Lord of the Rings Trilogy by J. R. R. Tolkien. Gene read this book this past year during a time when he was recovering from having his appendix removed. Behind the Veil (The Epistles of John) by Peter Leithart. BH’s Comments: I don’t want to have my appendix removed, but I do envy when someone gets a longer than normal stretch of time to tackle a big book. If Gene Franklin likes those other two books, then I am convinced that I need to read them. Paul, Moses, and the History of Israel by Scott J. Hafeman. BH’s Comments: Gabe described the book as scholarly. I generally don’t have the theological mind and time to do a lot of this type of reading. However, I recognize that sometimes I have to dive into the deep end of the pool. Love Walked Among Us by Paul Miller. BH’s Comments: Lee ought to be a Texas Ranger. I don’t mean the baseball team or the modern law officers who drive cars, but rather the old style Texas Ranger, carrying a gun and riding a horse. But he is also a serious minded elder. I am currently plodding through Paul Miller’s A Praying Life, and Lee convinced me that I need this book. Surprised by Hope by N. T. Wright. BH’s Comments: I bought Heaven a good while back based largely on Randy’s recommendation. I have the Wright book, but have not read them. Randy has been preaching on the New Heavens and the New Earth and found these books useful. In this case, no further purchase is necessary, but time and commitment is needed. BH’s Comments: Steve Wilkins began overloading my book shelves years ago. I know I would like the James K. A. Smith book since I read the previous volume in the series and loved it. The book on the Trinity sounds like a must read, for we often grasp little of what it means to be Trinitarians. I was totally surprised by the Jonathan Last book. Declining birth rates spell doom for our country and culture. This book has lots of implications for believers. We need more babies, more faithful discipleship, and more evangelism. Declining birthrates is a judgment from God, as Steve pointed out. Chivalry and honor in the midst of World War II. BH’s Comments: I enjoyed reading some of Ralph Smith’s books some years back, so I should get The Baptism of Jesus. Other than commentaries, there is not much we find on that remarkable event. Anything by Tim Keller is on either my “Have List” or “Must Have List” or “Should Read Again List.” I was convicted on my need to read the Leithart book, and I am hungry to read A Higher Call. That last book is an amazing story from World War II about two pilots, one American, one German. BH’s Comments: I chose I Heard the Owl Call My Name because I figured most of the men were not familiar with it. Also, as I pointed out in a recent blog, it reminded me powerfully of the need for a pastor to love his congregation. 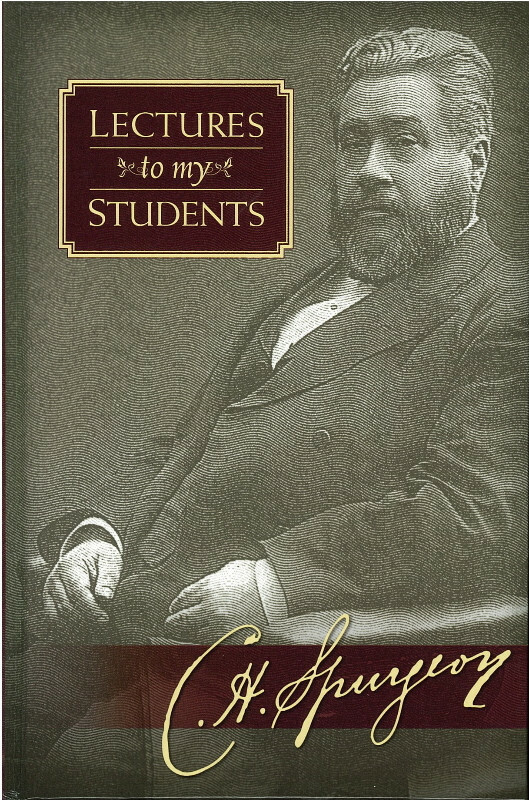 Spurgeon is simply fun and incredibly instructive. Even when I don’t agree with Spurgeon, I enjoy and grow through reading him. Each morning recently, I have spent time getting acquainted with A Praying Life by Paul E. Miller. After several occasions of hearing of this book and having it recommended, I acquired it recently and have started a slow read through it. I hope this book will be to me like a slow rain. I don’t want to finish it as much as I want to absorb it. I enjoyed the blessing recently of preaching a series of 7 sermons on the Lord’s Prayer (as part of a series of sermons on the Sermon on the Mount). Sermons on prayer have continually exposed my own soul to the need for a praying life. This portion alone is something I need to hear and hear repeatedly. I find that I need the simplist of instruction and exhortation. Each morning, it is easy to get overwhelmed with thoughts about the tasks for the day, the needs of the church I pastor and the school where I teach, and of my family. Prayers are needed to jump-start the day and to turn the focus in the right direction. So, I hope to continue absorbing this book. I also hope to see others, church members and other brothers and sisters in Christ, reading this book. I think the need for a praying life is a near universal Christian need. Published by Crossway, Covenantal Apologetics is a hefty study about the defense of the Faith. After a bit of time spent in A Praying Life, as well as some time reading various studies on the Sermon on the Mount and a portion of Spurgeon’s Lectures to My Students, I try to squeeze in a few minutes for Covenantal Apologetics: Principles and Practice in Defense of Our Faith by K. Scott Oliphint. Dr. Oliphint is professor of apologetics and systematic theology at Westminster Theological Seminary. He is literally standing in the shoes and on the shoulders of Cornelius Van Til, the legendary apologetics teacher at Westminster. Dr. Oliphint at Westminster in front of a painting of Dr. Van Til. Beyond labels, Dr. Oliphint is seeking to show how apologetics is to be practiced and lived. Too often, books on apologetics are intramural debates over this set of principles versus that set of principles. For all of Van Til’s greatness, what was often lacking were applications in the trenches. Hopefully, this book will provide some help. It has been quite a few years since I seriously read material on apologetics. Apologetics has often been for the brainy Calvinist-types what fox hunting was for the upper classes in England. That is not to diminish the true importance of defending the faith, but too much of what I read and saw seemed to lead to a life of carefree, fun sporting about, thumbing through this book and that, and making demeaning comments about those who did not defend the faith correctly. For several years, I needed the apologetic break. I needed to more devotion, more basic doctrine, more Bible content, and more exhortation to pray, witness, and live the faith. The flurry of atheists and atheist books did not make me feel threatened. Too many of their new, fresh, shocking arguments were old, stale, and long-since answered. But the time is now ripe for me to dust off the stacks of books by Van Til, Bahnsen, Frame, Clouser, Clark, Sproul, and others. But I will start with Oliphint’s Covenantal Apologetics. The newest book by one of America’s best narrative historians: Thomas Fleming. Some years ago, after reading dozens of books about the American Civil War Between the States, I began to think I was getting a grasp of what happened and why. To learn the give and tug of the five awful years on the battlefields is relatively easy. One only needs to read the 3 massive volumes, the nearly 3000 pages, that Shelby Foote masterly crafted in his twenty year writing odyssey on a five year war. I read Foote’s Civil War and have never recovered from his literary tour de force. Along with that, I read many other accounts of particular battles, larger campaigns, units in the war, and warfare itself. Most favored were the biographies. No Southerner can show his face in polite society without having read and savored the life stories of Robert E. Lee and Thomas J. “Stonewall” Jackson. Along with those two key figures, there are the many others, generals, colonels, officers, and even private soldiers. Concerning private soldiers, Company Aytch by Sam Watkins remains one of the best books ever on the life of a common soldier. Fiction joined fact as I ventured into the field of Southern literature and reveled in the accounts of William Faulkner, Caroline Gordon, Madison Jones, Allen Tate, and others. Although he is not classified as a Southern author, Michael Shaara recast the war, and in particular the Battle of Gettysburg, in The Killer Angels, which is an Iliad-type retelling soem of the conflicts within the greater conflict. Often more painful to read were the accounts of the events causing the war. The fifty to eighty years of failed efforts to avert and avoid the divisive conflict are a study in futility. Certainly, neither Northerner or Southerner ever knowingly desired the extensive destruction that the war wrought. Underlying the whole drama is the story of slavery. Slavery is the unpleasant glitch, the awkward and embarrassing national faux pas, the inadvertent slip of progress and enlightenment, the exegetically awkward Christian stance that gripped our nation for over a hundred years. The cure was, in too many ways, as painful and tragic as the disease. But the time was right to look again, to look afresh at the events that led to the War Between the States. But it was not the war itself or the impending class on American history that compelled me to read on the war. It was the author himself. 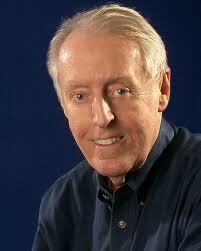 Thomas Fleming is one of the best and most prolific writers on American history. A large number of his fifty plus books have been on the American Revolution. His book Now We Are Enemies began his career more than fifty years ago as a historian and writer. His other books chronicle the role of Washington, the battles of the War for Independence, the details of the lives of the Founders, and the events that led to the conclusion of the war. I am amazed at the number of books Fleming has written, which includes fiction as well as non-fiction. Adding to my amazement is the fact that he continues to pour out good books. 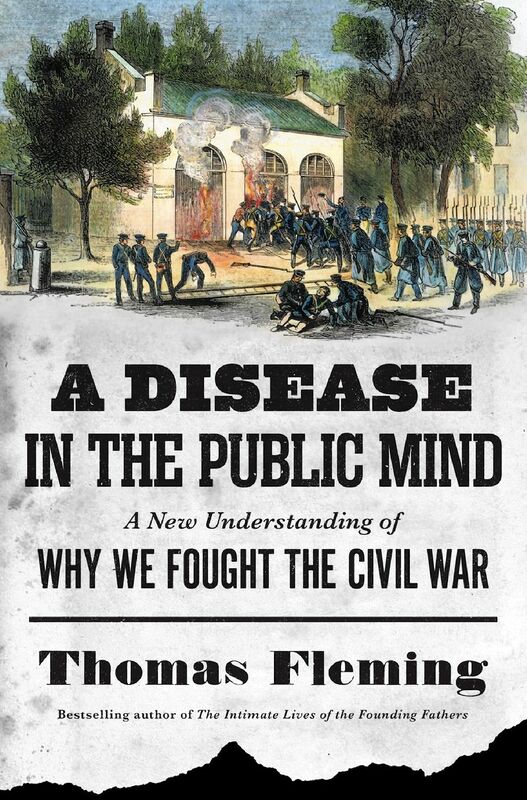 Fleming’s latest, A Disease in the Public Mind: A New Understanding of Why We Fought the Civil War, is a wonderful and delightful study. This book is a survey of the tensions regarding slavery that reached back before the American War of Independence. Men like George Washington and Thomas Jefferson, often pilloried for owning slaves, were truly vexed over how to deal with the slavery problem. 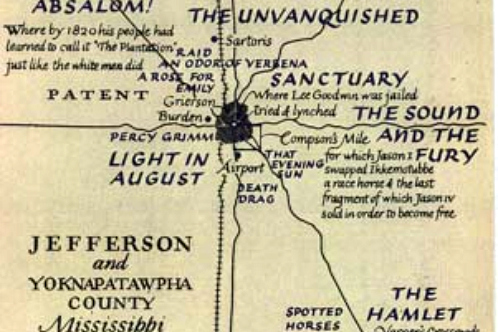 In the long debate over slavery, people fell into several camps. There were unflinching defenders of slavery, mostly in the south. Of course, the problem wasn’t confined to the future Confederacy. There were many well-meaning people who truly believed that re-colonizing slaves back to Africa would solve the problem. There were many people who were truly terrified about the possibilities of a slave revolt, similar to what had happened in Haiti. Then there were the Abolitionists. William Lloyd Garrison was the foremost. His answers were clear, direct, and totally unworkable. His efforts to deal with the problems did more to provoke and rouse the suspicions of the South than they did to help find a solution. The ever opening new lands to the west provided more grounds for both debate and fears. Anti-slavery people, free soil people, and farmers from the north were vexed over slavery in the territories. Southerners could read the political signs. The states where slavery was not allowed or was fading were gaining in population. As northern Europeans poured into the country, they were desirous of latitudes closer to the Old Country, and they were looking westward. The battle to defend slavery was increasingly futile in the House of Representatives where northern populations were increasing the anti-slavery votes. The Missouri Compromise and other actions kept the Senate numbers somewhat even, but with the peopling of the west, that too would change. It is interesting to speculate how and if slavery would have functioned in the western states. Ranching and the type of farming suited to the Great Plains would have called for different labor needs than the cotton-growing South needed. There were continual efforts to do away with slavery. There were on-going economic pressures to maintain slavery. There were guilty consciences; there were profits to be made; there were sermons for and against slavery. Then finally, there was war. Britain eliminated the slave trade and slavery over time through a series of legislative changes. William Wilberforce is a recognized hero in that effort. The U. S. had no Wilberforce. Even czarist Russia eliminated serfdom. The fact that the United States fought a war—with various issues contributing to the conflict—that resulted in ending slavery is still a puzzle. Thomas Fleming is right on track in seeing the problem of slavery as a disease, a disease in the public mind. Books contain many joys and pleasures. One of those joys is the discovery. Often the discovery is the realization that a book exists that you have not heard of. Then there is the joy of finding the book at a great price. All that precedes the delight of the content. The essay this is taken from is titled “Henry Fowler: Modern English Usage.” Highet says that Modern English Usage is one of his favorite books. He goes on to describe the oddities of Henry Fowler the man and some of the insights of Henry Fowler the linguist. I have a rather recent edition of Modern English Usage, which probably contains little of the original author’s work. Now, my never ending quest for books will include finding an original 1926 version of the book. 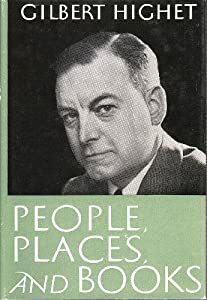 I picked up People, Places, and Books when I was at Wheaton College a few weeks back. We were helping Nicholas get moved in to his apartment, but we had the occasion to go visit the Wade Center. This wonderful place contains many artifacts, letters, and books that belonged to the Inklings, particularly C. S. Lewis and J. R. R. Tolkien. The Wade Center even has Lewis’ actual wardrobe that inspired his Narnia series. There is a small selection of books for sale at the Center. This one was a mere $3.00. I think that was a steal. Earlier in the summer, I found another steal. It is also another book by a now-forgotten scholar who also wrote about books and authors. The book is Regionalism and Beyond: Essays of Randall Stewart, edited by George Core. My copy looks almost exactly like this. 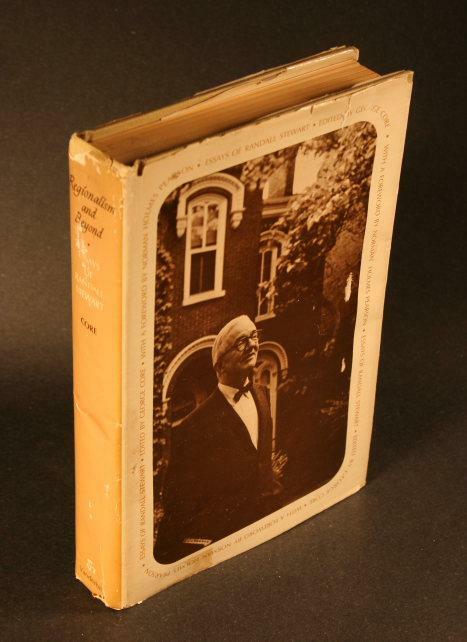 Randall Stewart (1896-1964), born in Tennessee, was part of the large circle of literary scholars and teachers that were taught and influenced by the Fugitive Poets and Agrarians of Vanderbilt University. Stewart himself was a graduate of Vanderbilt in 1917 and later went back there to teach. He was well versed in Southern literature and even wrote a book about it. He was also an expert on Nathaniel Hawthorne. His teaching duties carried him to major universities such as the University of Oklahoma, the University of Idaho, Yale University, Brown University, and then back to Vanderbilt. Regionalism and Beyond is a collection of essays about literature. Most of the essays are about either Hawthorne or Southern literature. I first became familiar with Stewart some years back when I discovered his outstanding book American Literature and Christian Doctrine. (Surprisingly, used copies of this out-of-print book are rather cheap on Amazon.) 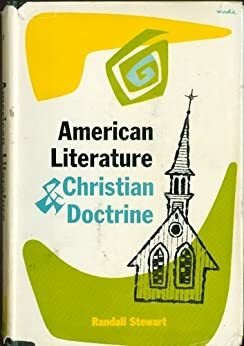 Anyone who is a Christian and who pretends to be well versed in American literature either knows this book or is excluded from my company. Back to the book of essays: I found Regionalism and Beyond at an antique store in Franklin, Tennessee. It was a mere $8.00. I found it hard to believe that a book published by the near-by Vanderbilt about a Vanderbilt scholar in a bookish town like Franklin would have such a treasure at such a cheap price. Just as Stewart’s teaching journeys carried him far from home, this book now is a treasured volume here in Arkansas. With American history as the topic for the year, I have been reading some books to prep my own mind and memories and ideas. 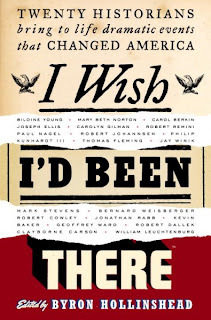 Last May, when we went to Wheaton College to fetch Nicholas home for the summer, I found this book: I Wish I Had Been There, edited by Byron Hollinshead. Twenty prominent American historians mix a bit of fact and fancy by choosing a favorite event where they wish they could have been present. This book was a fun read and review of American history. The contributors are a distinguished lot of modern historians and writers. One more in the long line up of great books by Thomas Fleming. A Disease in the Public Mind is a good history of the slavery controversy from the Founding Era to the War Between the States. Although I thought I knew much of this story, I was surprised by how much I learned and helped by how much I was reminded of. I will soon post a more complete review of this book. American Phoenix: John Quincy and Louisa Adams, the War of 1812, and the Exile that Saved American Independence by Jane Hampton Cook is almost all new ground for me. This book reads like a novel. I have not yet gotten far into it, but have enjoyed the style and pace of the book.